Successfully Added Voice and Telephone Recorder with FM Transmitter and MP3 Player (2GB) to your Shopping Cart. Introducing the ultimate portable digital voice and telephone recorder, with a car kit and a range of other interesting features. This Voice Recorder has an easy one click record function, timestamp recording and automatic voice recording. 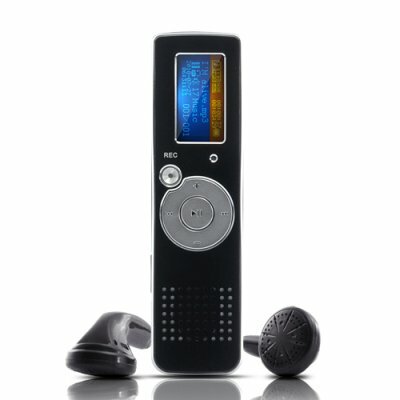 Its telephone recording function also allows it to be a secret voice recorder. This multipurpose digital audio recorder can be used in lecture theaters, class rooms, presentations, telephone conversation recording, and in meetings at the work place. With this great gadget you won’t miss any important information again. Just think about how many times you’ve worried over missing an important piece of information on the phone or in a meeting. This Voice Recorder is here to solve these problems whilst also providing you with a quality MP3 player for entertainment. This excellent Voice Recorder can be also used as a high quality MP3 Player, so you can enjoy music on the go, on foot or in your car. With 2 GB internal memory, you can load in roughly 200 songs for hours and hours of listening pleasure. This all-in-one multimedia device comes in a pocket-sized form factor that’s convenient to carry and a pleasure to use. Instead of carrying multiple devices, you can have this great gadget, record hours of sound and also use it as an escape from boredom by enjoying your favorite music. It’s a win-win situation; this gadget is really a lot of value for money. With an FM Transmitter on this Voice Recorder, it means you can transmit music to your car’s radio and play music out of its speakers. This digital voice and telephone recorder comes with 2 GB built-in storage and also works as a regular USB drive to store personal files as well as MP3 music files. With all these useful functions, it’s difficult to reason against buying one of these Voice Recorders. We all find carrying a USB drive around with us useful, we would all like to record some of our telephone conversations like interviews and sensitive discussions, and we would all love to have a convenient way to enjoy our music wherever we go, on foot or in the comfort of our cars, and so this is the gadget you need. This great Voice Recorder is on offer now for an amazing price. Why not click "Add to Cart" right away to buy one for your home, office, or car and then stock your online store with this incredible all in one gadget. Order today and we’ll ship it out tomorrow, it will also come with our verified 12 month guarantee, and so you have nothing to worry about. This great gadget is available from your best source for high quality, low price electronics, Chinavasion. Languages: 17pcs language：Simplified Chinese, English, Traditional Chinese, Japanese, Korean, French, German, Italian, Dutch, Portuguese, Spanish, Swedish, Czech, Danish, Polish, Turkish, Hebrew. The one-touch record is cool. The built-in microphone is also way better than other recorders with an external microphone. The instructions weren't that helpful but after a day I figured out how to get around the menu. Everything uploads easily to my computer. And I even put some songs on it and the speakers aren't half bad. Enjoying it more and more everyday.